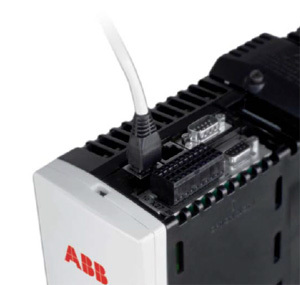 Mint® Machine Module for Intelligent Drive Systems - ABB Inc. The Mint® Machine module transforms MotiFlex e100 drives into a powerful intelligent drive system. It assumes complete control of the drive, onboard I/O, communications, and networking features, eliminating the need for external controller or PLC. Available as a dual-axis (host MotiFlex plus one analog axis) or a multi-axis version capable of coordinating four axes via real-time Ethernet POWERLINK, plus one analog axis. Both modules offer advanced motion control features, CANopen expansion, RS485, Ethernet POWERLINK and multitasking motion programming.